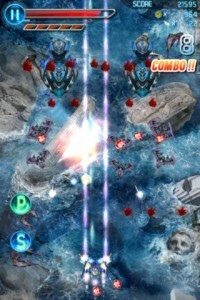 AstroWings 3 Icarus iPhone Game Review. The alien ships are attacking. But they don't know what they're up against. Because the warrior goddess Hera is not just going to stand there and watch as the aliens are taking over the galaxy. She's got the most powerful aircraft on her side, and really big guns to destroy the enemies. 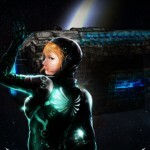 All she needs is somebody to help her control this mighty ship against the alien attack. And you're just the one to do the job. 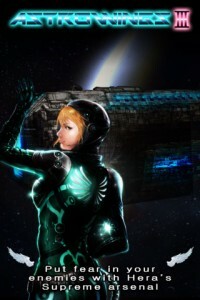 So, grab your iPhone or iPad and purchase AstroWings 3 - Icarus from the AppStore. AstroWings 3 - Icarus is an addictive arcade game, where you have to control an aircraft, along with its weapons, to destroy the enemy ships attacking you. The controls are extremely simple: you only need to hold your finger on the aircraft and move it from one end of the screen to another, as it constantly shoots at the enemies. But as the alien ships get bigger and more powerful, the game gets more challenging, so you'll need to move faster to dodge their bullets, and use bigger guns to take them out. 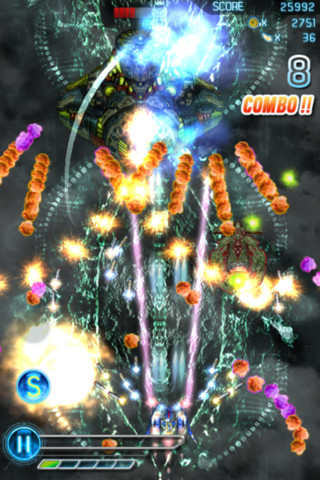 Destroy more and more enemies with every game you play, clear stages, collect points, and turn the galaxy back into the peaceful place it used to be. As you start the game, you'll be able to create up to 3 different profiles on a single device. You can choose from 3 types of aircrafts, and difficulty levels. However, only one of the aircrafts and one difficulty level are up for grabs from the start, and you'll have to pay extra to choose Ares or Poseidon as aircrafts, or set the difficulty level to normal or hard. Once you're done with your profile, it's time to start the game. At this point, there's only one stage you can start the game with, but even if it's the first one, it will take some skill to clear it, even if the difficulty of the game is set to easy. The first thing you'll like about AstroWings 3 - Icarus is just how natural it comes to play it. This is mainly because most of you probably played the classic version when you were a child. Back then, you probably played it on your PC, or had one of those devices with 99 games on them, which were actually just 10, and the rest up to 99 were different versions of Tetris. Back then, your aircraft, your bullets and the enemy ships were just black dots on the screen. Or a blurry version of what AstroWings 3 - Icarus looks like today. But the principle was mostly the same. Only that AstroWings 3 - Icarus comes with substantial improvements. First of all, the graphics are nothing like the old ones. They are still pretty simplistic, but effective. There are all types of ships, of different shape, color, dimension and design. As well as the different backgrounds and special effects the guns make. And AstroWings3 - Icarus also makes the game more engaging by adding game stages, different types of aircrafts, power-ups and upgrades you can make by purchasing or collecting coins as you destroy the enemy ships. As any redesigned classic, AstroWings 3 - Icarus is particularly attractive because it brings back all those childhood memories. It might not be as captivating and engaging as an action RPG, but then again it's these types of games that usually keep us up at night, restarting the same level over and over again. What do you think of AstroWings3 Icarus ? Scroll down for our comment section and let us know!